Crew: Chandler Johnson, Crystal Johnson, Stephanie Most. Sponsors & Support: Kathi, Dad, Most Trucking, Finish Line Raceware. 2 WKA Grand National wins. 2 WKA Dirt Series Championships. 7 IKF Grand National wins. Expert Driver Award in IKF dirt and pavement. 2 KART National wins. 2000 Tulsa Shootout win. Many Track Championships with over 250 total Feature wins. Finished 10th in 2005 NMMA Points in my Sawyer Mini-Sprint. My first year in Late Models I had 5 Top 5 finishes and finished 9th in Points. 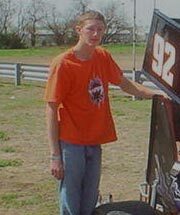 10th in 2006 Super Late Model Points at ACS. 7th in 2007 Super Late Model Points at ACS. 2008 Chili Bowl Tuesday Feature win. 2010 IMCA Deery Brothers win at Boone. 2010 Shelby County Speedway Track Championship. I started racing Karts at I-29 Speedway and won Junior Gas Points my first year. From there I have raced Karts all over the United States and have won many National races in the past ten years. 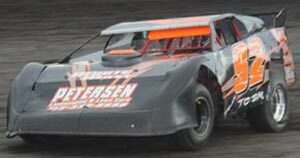 I have raced an IMCA Modified a few times also. In 2004 Ted Wood let me drive his 600 Car at Wavelink and I won a heat race. I bought a Vision car and raced full time in 2005. I raced a Super Late Model in 2006 and 2007. At the 2008 Chili Bowl, I won the Tuesday night Feature in a Midget. Race whatever I can and have fun at it. Keep moving up if I get a chance. #92 was my dad's number when he raced street Stocks and Modifieds.